When I read the essay "Chasing Beauty: An Addict's Memoir" by Good Men Project publisher Lisa Hickey, I was riveted. I'd been turning to The Good Men Project for insightful commentary on gender issues aimed at men for a while, but this was different. This was speaking to men, yes, but it was also speaking to me: "[W]hen I’m beautiful—or close to beautiful—it’s all I think about. When I’m beautiful and I’m with you, I’m wondering if the guy across the room thinks I’m beautiful. I think beauty is going to connect us; but I’m not connecting with you, I’m connecting with a beautiful image of myself that I think you might like." If you followed my month without mirrors project, you know that divorcing myself from my image of myself was one of the major themes I was working with—so to read someone else share her own thoughts on the matter was a thrill. I reached out to Lisa to thank her for her work, and she responded with what in some ways functions as a sequel to "Chasing Beauty." This time, it's "Letting Myself Go." It’s five years ago, and I’m walking down the street with Caroline, a work colleague; we just had grabbed a couple of salads at the nearby cafeteria, and she’s asking about my dating life. I murmur what I hope is something non-committal about the non-existence of a "dating life," and she says “Yes, I had a friend who also let herself go and my friend found it really hard…” And that was the last thing I heard. The implication that I had somehow “let myself go” was just too hard to bear. I couldn’t listen to another word she said. It was true I was no longer beautiful. It was true I used to be beautiful. But “letting yourself go” implies that you woke up one day and said, "Aww, screw it, ugly wins" with a shrug of the shoulders. Or perhaps you gradually crossed off this and this and this from your beauty routines. But it didn’t come close to acknowledging that there was still a Herculean effort going on with me vs. the forces of nature, and that the tidal wave of ageing was simply winning out no matter how hard I fought. I’ve written about my addiction to beauty that I’ve had most of my life, but beauty wasn’t all I was addicted to. It took me an equally Herculean effort to get sober after I became a blackout alcoholic at age 14 and drank every night of my life for the next 30 years. The addictions went hand in hand. I never understood the concept of being comfortable in my own skin. And I couldn’t stand it. So I drank to get rid of me. As a long-term life plan, it wasn’t the wisest of choices. Caroline’s dig at having "let myself go" came at two years into being sober, when everything was still perilous. There was no escape route. I had to figure it out. I had to get a life I could own and embrace. A life I could own—that was a new concept for me. About that time, I was realizing something profound about my interactions with other people. I couldn’t recognize faces. I had always known there was a problem, but now it seemed impossible. Everywhere I went—my kid’s hockey games, work functions, meeting someone for coffee—I had no clue who people were. Men, women, children, would come up to me, have a conversation, and I had no idea who I was talking to. I started to panic about going out in public. It was one thing if someone was the same place I had seen them last—office cubicles were a pretty safe bet—but anywhere else I’d have to search for contextual clues to recognize someone—clothing, the room we were in, height, glasses, voice, piercings. Without something specific, I couldn’t do it. I couldn’t recognize someone I had met the day before unless they had really specific unique qualities. I was constantly smiling or saying “hi” to people that might be someone I knew, just in case they were. I couldn’t tell a complete stranger from someone I had known for months. It was maddening, and I found a name for it—prosopagnosia, or face blindness. I never knew why I had it, or what caused it. When I see my image reflected on a mirror behind a bar I think, Oh good, I look like a woman who is having a good time out with friends. Or I’ll see my reflection in a darkened windowpane, hunched over my computer with a pencil twirled through my upswept hair, and I’ll think, My, don’t I look like a writer? Or I’ll walk to a fancy restaurant and see my high-heeled, pencil-skirted silhouette in the glass of the door and think: I pass as someone who belongs here. You’ll notice what these have in common: My thoughts upon seeing my reflection are both self-centered and distant. I’m seeing myself, but not really—I’m seeing a woman who looks like she’s having a good time, or a writer, or someone who belongs at Balthazar. And it hit me. My inability to recognize other people’s faces happened because—whenever I met someone—in my mind, I was visualizing my own face, not theirs. Everything clicked. I had been so worried about how I was being perceived, that it was me I was seeing in every situation, not the other person. No wonder I couldn’t remember them. This story really, truly does have a happy ending. I’m still sober, and along with it, all the joy of having a life I’m not constantly trying to run away from. Accepting the fact that beauty cannot, should not, will not be the defining quality of my life forced me to figure out which qualities should be. I learned to talk again by writing. I learned to connect through social media—slowly, learning about people first, caring about them first, letting them care about me long before they even knew what I looked like. I had always wanted to be funny, so I took a humor-writing course, and then a stand-up comedy course, and then an improv class. People laughed. I wrote poetry and did poetry slams. I learned to love public speaking—a feat I never would have thought possible. Public speaking, after all, requires you to actually connect with an audience, not just stand up there and look good. One of the first times I tried, it was a presentation to a room full of 75 people, most of whom I had known in various times in my advertising career. And I started out by saying “I bet most of you are here today because you didn’t actually believe that I could speak in public.” Loudest laughter I had ever heard. Somewhere along the way someone told me, “If you want self-esteem, the best way isn’t to tell yourself you look good. It’s to go out and do something esteemable.” OH. Somewhere else I heard, “Love is an action word.” OH. “Feeling” love wasn’t enough to make the other person love me. OH. A sentence from a book: “Seek to connect, not to impress.” OH. OH. And, gradually, gradually, gradually, I realized—once I didn’t have to worry about appearing funny but could talk and upon occasion have a funny sentence come out of my mouth; once I didn’t have to worry about appearing intelligent but could just offer insights that combined my knowledge with the other person’s equally important intelligence; once I didn’t worry about appearing loveable, but instead could just act with love to the person I was with—then—then—then—I could actually get into the flow with another person, just as Autumn described it. Not by performing for other people; and certainly not by desperately trying to come up on the spot with an appearance that I hoped would impress them. And once I got in the flow with the other person, even my memories of interactions changed—my memories became about them, not me. And I was able to recognize faces. I had finally figured out that in order to connect with people—really connect with them—I, did, in fact, have to let myself go. And that’s something I can live with. Lisa Hickey is publisher of The Good Men Project, and CEO of Good Men Media, Inc. When she’s not writing about beauty, she’s writing about men. 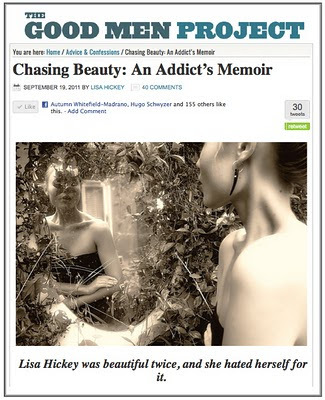 Her post on The Good Men Project that started the connection between Lisa and Autumn is here: "Chasing Beauty: An Addict’s Memoir." Autumn--thank you for reposting this here. This is a stunning line: My inability to recognize other people’s faces happened because—whenever I met someone—in my mind, I was visualizing my own face. I have someone I need to share this line with! I'd felt a little haunted by "Chasing Beauty." So glad the author's having a happy ending! Also, I'm sorely tempted to whack that Caroline character. Just me? Hi all -- thanks for commenting, and thanks, Autumn for giving me the space to do a guest post here. Honestly -- both posts sound a little sadder than they are. I have a great life. But what I love is that Autumn's perspective adds to my own and helps me make sense of a world I couldn't always make sense of. In a funny I had posted my original beauty piece on Open Salon, where I also blog, and I got tons of comments. And I was driving with my 16 year old daughter Shannon -- the one in this post, who said she couldn't give up looking in a mirror. She had read my "Chasing Beauty" piece when it was on Good Men Project. And I told her that on Salon "Half of the commenters suggested I go to therapy". And she laughed so hard she spit out her blue gatorade out all over my car and then could not stop laughing. And she was laughing NOT because she thought I needed therapy (that would have just been sad -- mom is crazy). And NOT because she simply disagreed with them (that would have been dismissive, with a "crazy commenters" and a shrug). But she laughed so hard because she knows me so well, and her and I talk about beauty enough that she could see exactly why *other people* might think I need therapy. It was awesome. I think she's still chuckling. Appreciate the very open dialogue going on about this topic. Terri, that was one of my favorite lines too! My mother once said the reverse--that when talking with someone, she imagined she looked like them. She'd feel "thin but weak" talking with one friend of hers, "young and vital" when talking with me, etc. It was interesting to me because I don't think I really do that--I think it's two sides of the same coin, though. Rebekah, totally not just you. "Let herself go too"?! Lisa, thank you again for such a great piece. I think that your current happiness shines through in both pieces--that you have such a keen understanding of your past means that you've moved through it. There's no self-pity here, just a thorough searching, which is what makes it a great dialogue-starter. It's weird, I get what she's saying but don't quite connect with it. In part, because I've never considered myself beautiful at any point in my life and because the "month without mirrors" was two years long, and it was when I was most deeply depressed and lost in self-hatred. I couldn't bear to see what I looked like to I papered them all over. Recovery was all about learning to look in a mirror for me. I always assumed things would have been different if I had felt beautiful as many women seem to feel in my teens or early 20s. I guess what I can take from this is nothing would have been different. Futurebird, I'm glad to hear you speak up. When I did my month without mirrors I heard from some women who had similar experiences--avoiding the mirror had been a coping mechanism for a long time, so obviously the experiment had a different effect. In any case, in talking with dozens of women about beauty what I've learned is that women's reactions to appearance more often than not are less about being considered beautiful or not and more about a generalized reaction to the beauty imperative. Your way of handling it might have been different from Lisa's, but I'm guessing the root is the same--as you said, not much would have been different, even if the surface struggles are the same.